Luella sat in the darkness of her bedroom and tried to process her feelings. She couldn’t bear to have lights on as the big wedding picture of her and Wes was on the wall facing her. The picture bought back memories, none of them pleasant. Her face expressed no emotion but inside those emotions churned and churned. At eight O’clock she’d put their child to bed and watched as the little girl fought against sleep but had finally succumbed. Luella could remember smiling as she turned out the light and left the night light with its dim outline to guide her in the event little Anna woke to call for a drink during the night. Anna was the only bright spot in her life. She’d waited until 9.30 for Wes to come home. He’d gone out with the boys that morning with his hunting rifle. It was not hunting season but that didn’t seem to worry Wes, he’d always been the rebel in his family and they were appalled at his behaviour and certainly sympathized with her when they visited and saw the tell-tale signs Wes had been brutalizing her. Wes’s father Jay was a decent man and had man handled his son when it became clear he was not treating his family as he should. Luella had begged Jay to leave him be as she feared what would happen to her when Jay left to go home. How had she gotten into this mess? Her family were religious people, pillars of society. They’d instilled into their children the principles of the Good Book and the children had gladly accepted these principles as their guiding principles as they grew up. Luella loved her church and enjoyed participating in all the activities, particularly the youth activities organized by young Pastor Small. Luella shuddered at the thought. How was it that such a safe place had been the venue in which her present situation should have started? Wes and his brothers had been part of the church group, so when he offered Luella’s father Sam to see Luella got safely home from the choir that evening Sam agreed with the proviso she should be home within a half hour of the function closing. Wes had been very respectful and had quickly agreed. Sam was on friendly terms with Wes’s family. Their families had been neighbours long before Luella came into the world. Now there’d been some dark rumours among the young at school about Wes but as his behaviour at home and at church was exceptional adults put it down to teenage jealousies. On that evening Luella learned those dark rumours were true. She was shocked when on the way home Wes diverted to a secluded place in the woods and parked. Luella had reminded him they needed to be getting home as he’d promised her Dad to get her home on time, but Wes made his moves and Luella pushed him off and got out of the car to walk home. She was shaking with surprise and indignation and was grateful the car remained where it was. It was dark, but she knew the trail well and began to enjoy the wind on her face as she decided to run the rest of the way home. Then out of the dark a hand appeared to hold her mouth shut, and another held her and began to drag her to the ground. Luella bit his hand hard and he grunted in pain then hit her so hard she fell to the ground unconscious. Later she awoke to the horrible realization Wes had defiled her. She wept bitterly and began the slow and painful walk home where anxious parents rushed her inside as they saw her torn clothes, condition and distress. Sam had been on the phone to Jay hours ago but had been assured when questioning Wes, he’d dropped her off at her parent’s front driveway. It was a long driveway leading up to their ranch house. There was a long interrogation and Luella frightened and disoriented objected when Sam insisted on a confrontation at Jay’s home. It was the middle of the night, but righteous indignation had been aroused and Sam wanted it settled regardless of their long-standing friendship as neighbours. Wes was called, and an explanation called for, but he stuck to his story. He said he’d dropped her off home at the gate. Must have been someone else and he was terribly sorry. Should have seen her to the front door, but she insisted on getting off there. Both sets of parents looked from one of the teenagers to the other to try and figure out what the truth was. “I bit him before he hit me, have him show you his hand!” Luella began to cry uncontrollably again. But Wes did not go to his room. Before sun up he was out on the road hitch hiking with a few clothes rolled up in a carry bag. He’d try his luck in another state and see if he could find work there. However, after sleeping rough and finding little work for two months he wrote to his parents asking if he agreed to marry Luella they’d let him come home. He gave no return address and mailed it from another town in case police had become involved, but both families in consultation with Luella had decided not to alert the community to their problem by going to the police. Now Wes’s younger brother Ronny, same age as Luella had been terribly distressed his brother had done such a wicked thing to her. So, when Wes showed up looking gaunt and fearful and approached him working on their ranch to see whether it was safe to come home Ronny lost control and began beating him. His mother happening to see it from a distance through the kitchen window alerted her husband who ran to pull them apart. Then gave Wes a few slaps himself before dragging him to the house. Wes had no more fight in him and let them drag him along. Jay phoned Sam immediately. “This rat of a son of mine has come home. Can you come on over and we’ll have a conference about what to do with him. The mark of a good first chapter is whether the reader is tempted to turn the page. You certainly succeed in that here. Another story of the powerful exploiting the weak and hoping to get away with it. We see in in the news every day. Sad but so true. You are depicting that very well so far in the story too. Yes Luella was betrayed and in a sense will be betrayed in the next chapter too. We tend to write stories about the positives in life but even the best of people have some horrible situations to face in their life and hit the crossroads having to make a decision whether they’ll pick up the pieces and move on or spend the rest of their life as a slave mentally to what has happened to them. A gripping read – a story that rings true in this day and age unfortunately . Waiting for the next chapter. There has always been selfish power playing by some and it takes different forms. But today with instant communication through the media it is usually brought to our attention so we can be aware of the dangers involved and hopefully deal with it. You tell a good story, and although Wes’s actions are despicable, I can’t help hoping that there is some redemption for him. True he causes suffering but I imagine that he is miserable himself. 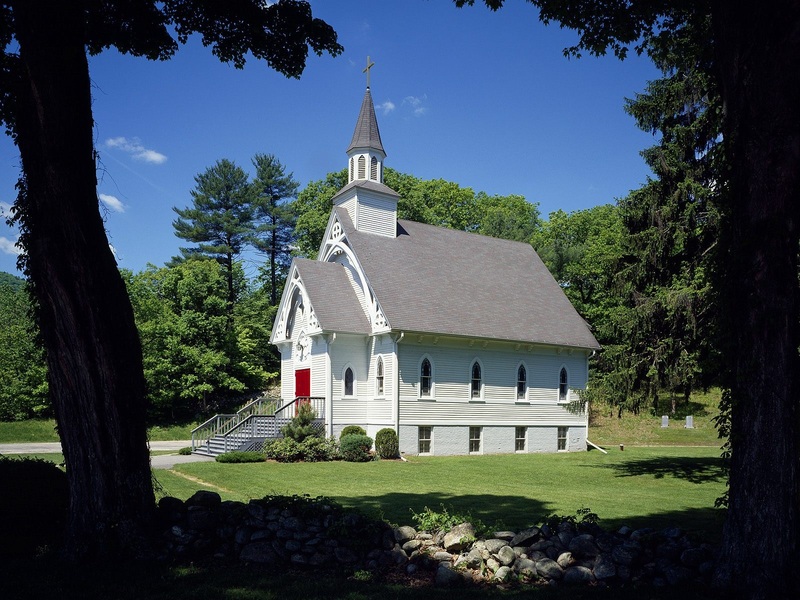 Lovely accompanying picture of the little white church adds to the sadness and irony. It’s interesting how upright pillars of society can produce a rotten apple and the opposite is also true. People who are raised under despicable conditions can end up as pillars of society. I know the debate about genetics and environmental conditioning, but in the final analysis its a persons own choice to become a contributor to society well being or take the opposite path. Some people are beyond redemption and need to be taken out of society for the protection of all. The story also deals with poor decision making by those who should have known better. I think you’ll enjoy the next three chapters Jane. God, this is bad. I don’t like Wes. But then again, you do spin great stories, Ian, and keep your readers invested. Unfortunately there are people in this world who present themselves well on the outside but are rotten on the inside. Eventually it has to come out.